All of a sudden my children can’t get enough Rice Krispie Treats. I think it has something to do with the store bought ones I put in my backpack as a quick snack option for our Disney trip a few months ago. 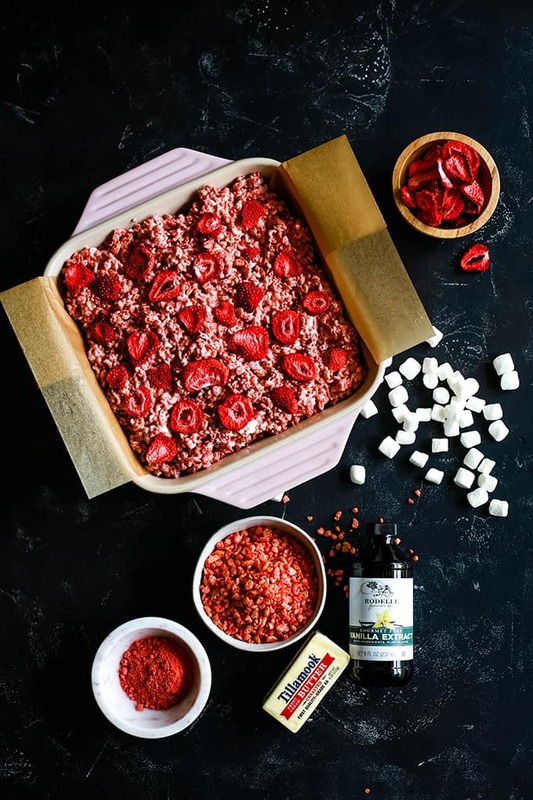 After making several batches of homemade bars as of late, I decided to put my own spin on them with this Strawberry Rice Krispie Treats recipe. 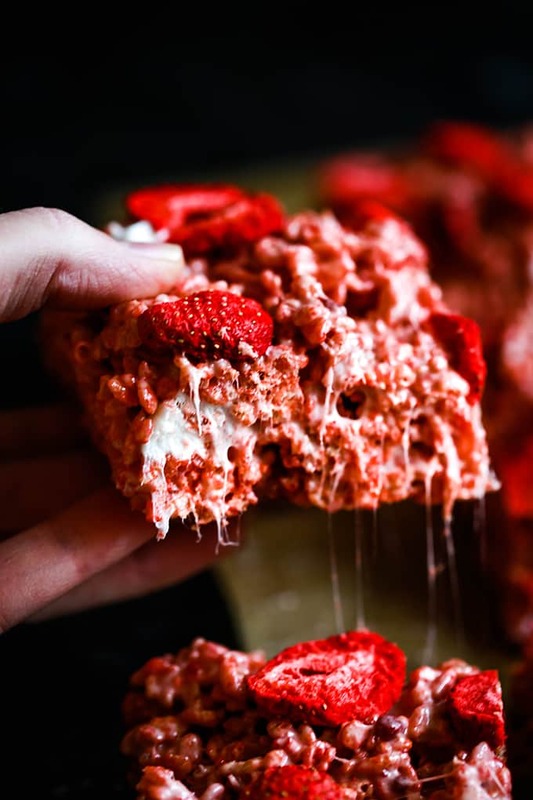 These Strawberry Rice Krispie Treats have not one, not two, but three layers of strawberry flavor. They’re perfectly pink in every way! What’s the main ingredient for Rice Krispie Treats? Rice Krispies Cereal, of course! And I found a box of strawberry flavored cereal that really gives these treats their springtime hue. Are you a fan chocolate, too? (Who isn’t?!) You’ll definitely love my S’mores Stuffed Chocolate Krispie Treats as well! I’ve also used strawberry fruit powder – the same powder that’s used in my Strawberry Sugar Cookies recipe – for another layer of strawberry flavor. Just a few tablespoons of powder really ups the strawberry flavor of this six ingredient dessert. TIP: Not sure where to find strawberry fruit powder? I purchased mine online. The last layer of strawberry flavor is also the prettiest! 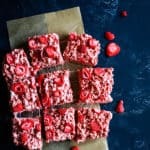 Slices of freeze dried strawberry decorate the top of each bar to really pack a flavorful punch in each and every bite. TIP: Strawberry fruit powder is simply pulverized freeze dried strawberries. 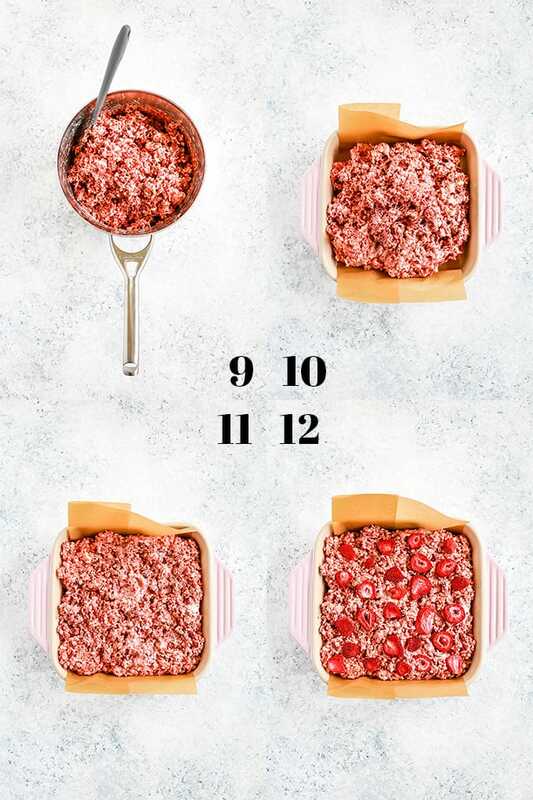 In a pinch, you could make your own with extra freeze dried strawberries in your food processor. All of the other usual suspects – butter, vanilla and marshmallows – are also present and accounted for in these super easy cereal bars. 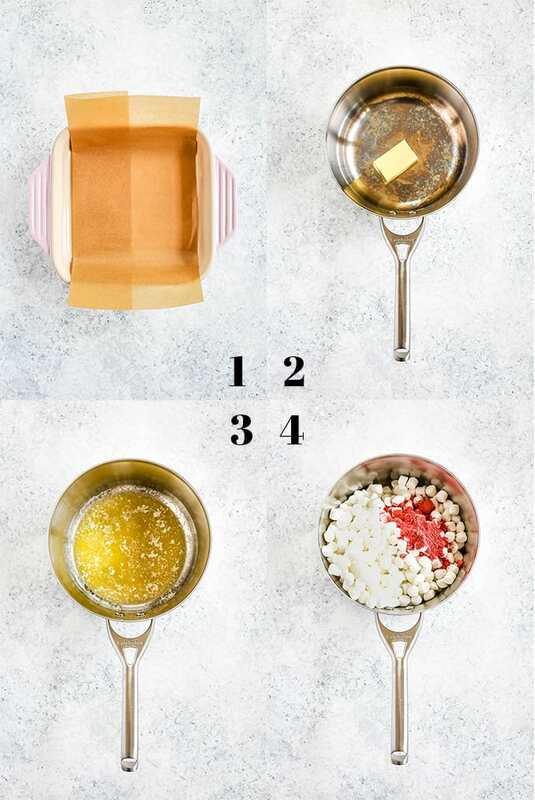 Not only are marshmallows melted together with butter as in a typical recipe, but a cup of marshmallows are also stirred in with the cereal at the end so you’re left with pockets of marshmallows throughout. My favorite part! They’re ooey. They’re gooey. 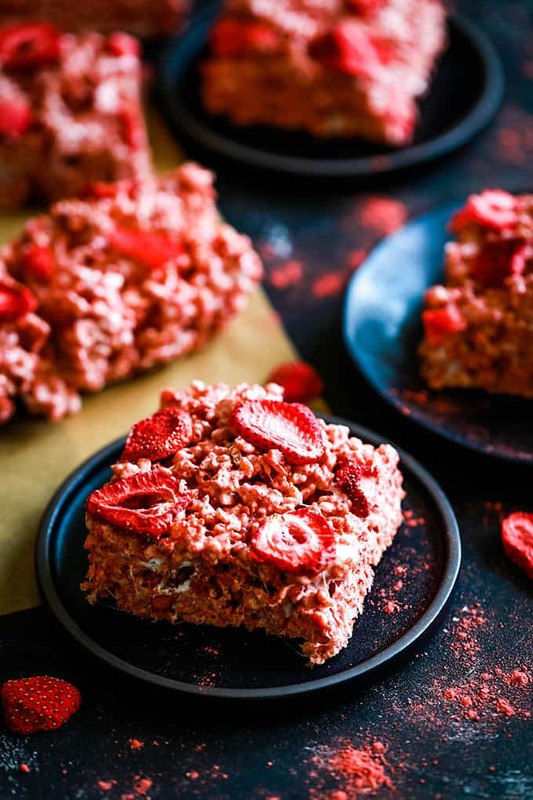 And these Strawberry Rice Krispie Treats are absolutely irresistible. 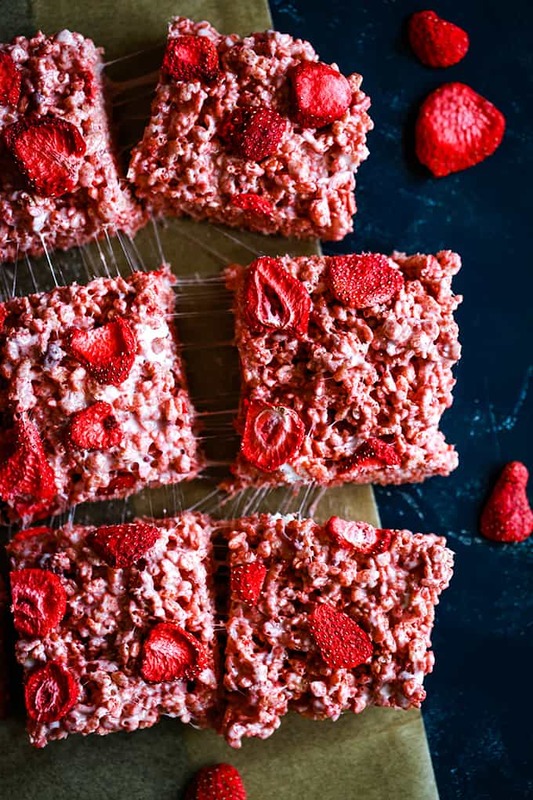 For photography purposes, I sliced these Strawberry Rice Krispie Bars into nine squares but in reality, this recipe makes a dozen bars in our house. They make the perfect after school or lunchbox treat and received two thumbs up from all six of us. A rare occurrence these days! Line a 9″ x 9″ baking dish with parchment paper. In a large saucepan, add butter. Place saucepan over low heat and melt butter. 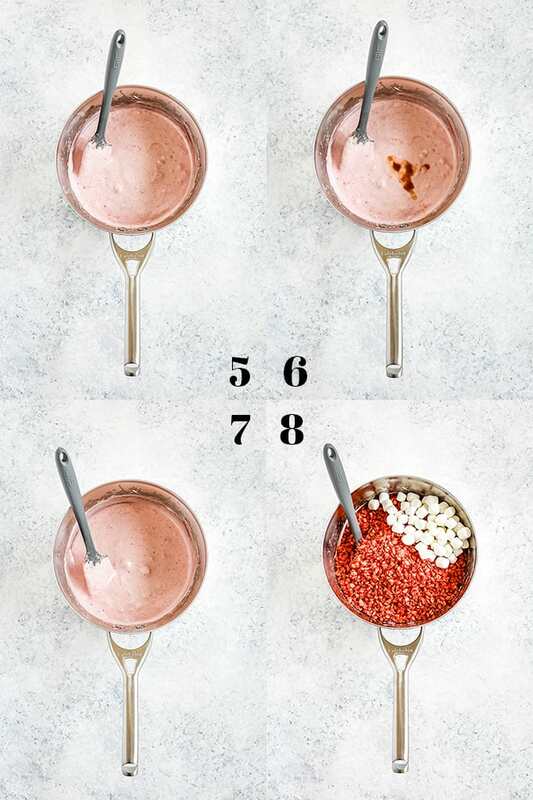 Add marshmallows, reserving 1 cup, and strawberry fruit powder. Stir together until smooth and melted and completely combined. Pour cereal into marshmallow mixture with reserved marshmallows. Spoon cereal mixture into parchment lined baking dish. Lightly press cereal mixture into baking dish with moistened fingertips. TIP: Press gently just until the mixture is spread out to fill the pan. If you press the mixture too firmly, the end result will be very dense instead of light and airy. Lightly press dried strawberries into top of cereal mixture and allow to cool for one hour prior to cutting. 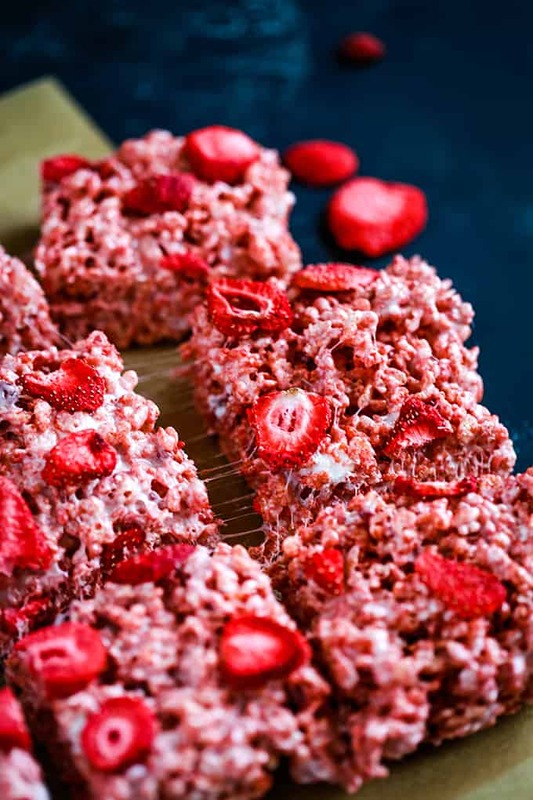 If you’ve tried these Strawberry Rice Krispie Treats or any other recipe on Melanie Makes, please let me know your thoughts in the comments below. I love hearing from you and respond to each and every comment! Line a 9" x 9" baking dish with parchment paper. 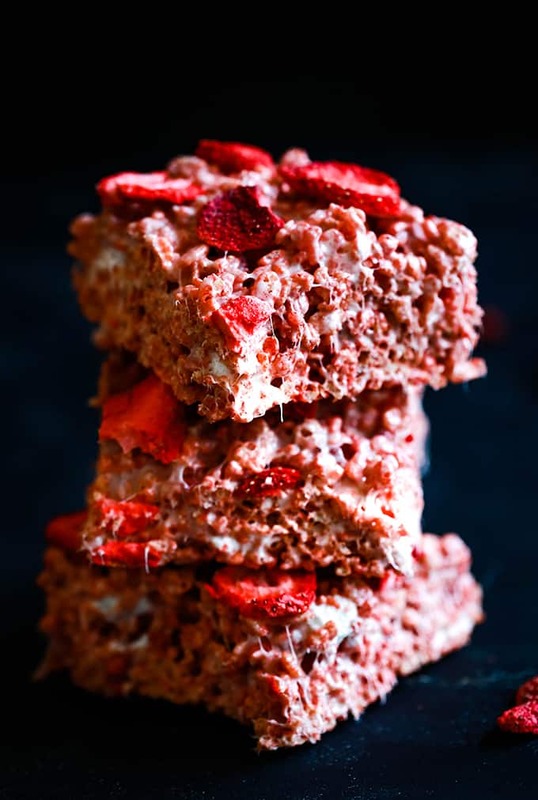 Adapted from Perfect Rice Krispie Treats. Want to make more strawberry desserts? I’ve got you covered! These Strawberry Lemon Blondies, Strawberry Shortcake Cheesecake and Nutella Strawberry Tart are all on my must try list. How is it possible that I've never made these before?! They were incredible! Thanks! 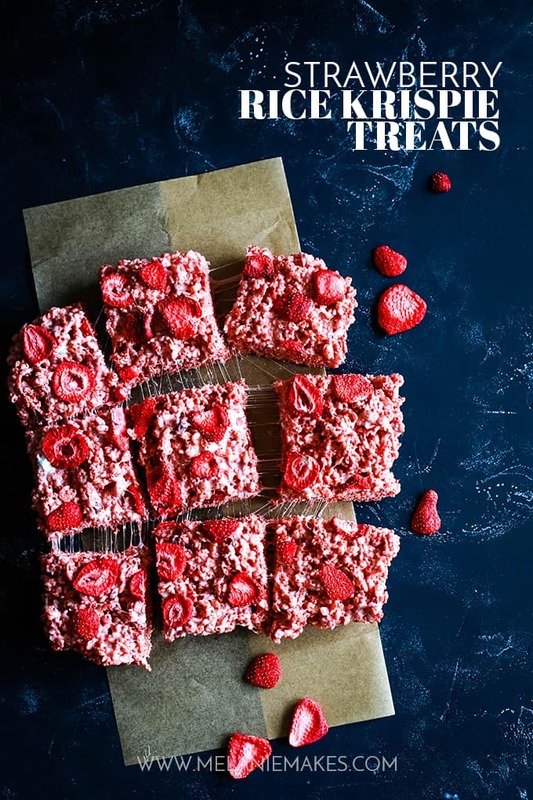 What a sweet twist to rice krispie treats! My kids will love making these! Oh my goodness, these are amazing!! The perfect treat! Great shots ~ I can't take my eyes off these! You're so kind, Sue - thank you! Oooh, these look SO good, can't wait to try them! Love this strawberry twist to a classic! Ooey gooey goodness! These really are a treat, who needs Easter eggs this is awesome!